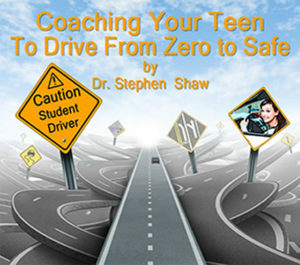 "Coaching Teens to Drive from Zero to Safe"
Thank you for preparing such a thoughtful and useful course. I will never forget it. Satisfies the Nevada Driver Education requirements for Teens to obtain a Driver’s License. Coaching Your Teen to Drive is a complete, step by step guidebook for parents who will be teaching their teens the most challenging and complex lessons of their young lives… driving a car in traffic. The information in this book was written as an easily understandable roadmap to a final destination of a competent and safe driver. This guidebook will greatly reduce a parent’s stress and fears common with instructing a teen to drive.